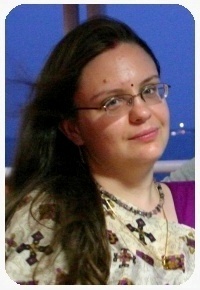 This poricha kozhambu is also a Kerala style kozhambu. 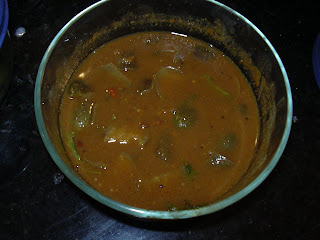 In this kozhambu we use Azuki Bean (Black Kaaramani) instead of Toor dal. The main ingredients are as follow..
At first, take a small pan pour a drop of oil and fry Coriander seeds, Channa dal, Red chillies, Fresh coconut and Fenugreek seeds with a pinch of asafoetida powder, to golden brown. Let it cool and grind it into a fine paste. Keep it aside. Cook the Kaaramani in a pressure pan upto 6 whistles. Keep it aside. Now take a wide pan, cut the brinjal, mix the tamarind paste, turmeric powder, sambar powder salt and let it boil(cook) for 10 mts. Now add the coconut paste to it and let it boil for another 5 mts. Now add the cooked Kaaramani and jaggery to it and let it cook for another 7 mts. Turn off the stove now. Take a seasoning pan, pre heat the oil add mustard seeds, fenugreek seeds, asafoetida and curryleaves and let it fry till golden brown. Now pour it in the poricha Kozhambu. Now poricha kozhambu is ready to serve. want to try this way..but doesnt know where to get that azuki bean. vidya nice entry.a gift for you.... Check out my blog for a surprise. Wow something new to me. Looks gr8.